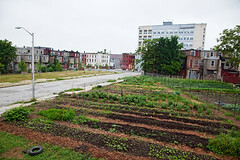 Sustainable organic vegetable garden, social space, educational park. and community-supported agriculture (CSA) co-op. 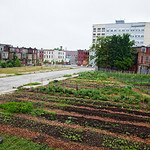 Participation Park is an ongoing public art project and activist initiative based on converting a vacant lot in east Baltimore into an urban farm, social space, community kitchen, free store, radical planning studio and adventure playground. Baltimore Free Store has semi-permanent site in red trailer. Salad Saturdays 5-7pm.